1 Cut apricots cut into 1 cm (approximately 1/2-inch) cubes. Peel and finely chop ginger. 2 Bring apricots, ginger, red pepper flakes and 50 ml (approximately 1/4 cup) of water to a boil in a pot. Cover and cook for 7-8 minutes on low heat. 3 Season to taste with honey, cinnamon and salt. Allow to cool. 4 Rinse cilantro, shake dry and pluck leaves. Set some leaves aside for garnish. Chop remaining leaves finely and mix with the chutney. 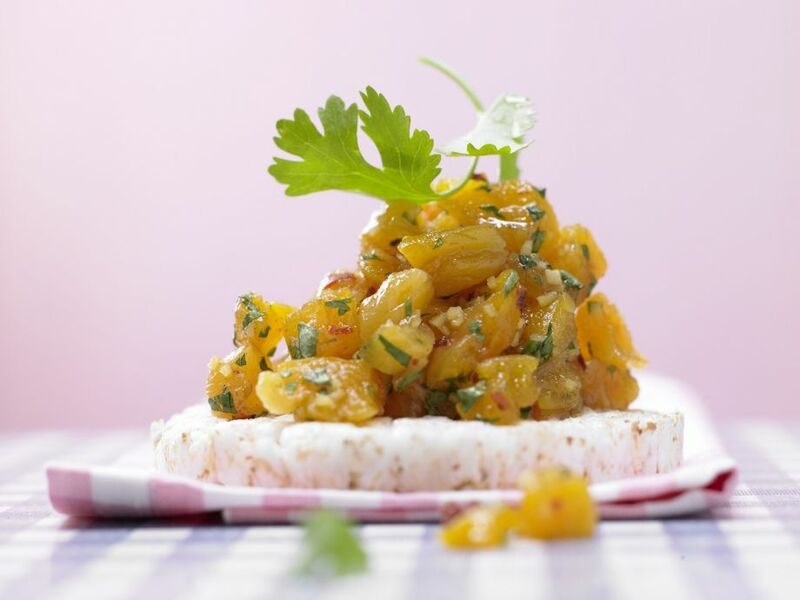 5 Arrange apricot chutney on the rice cake and garnish with cilantro leaves.